I’m always on the look out for new snacks to make for the boys, and came up with the idea to make Pizza Scrolls last week in an attempt to use up some of the ham we STILL have leftover from Christmas. The boys both LOVE helping to make pizzas, so they naturally both wanted to get involved in making these scrolls. This is the same scroll base recipe as I have used in the past, but this is the first time I have made these using my Thermomix – instructions for both below. I really like how easy it is to put together – especially as there is no yeast, so no waiting around for the dough to rise and having to deal with impatient little helpers. You really could add any combination of ingredients to this recipe, it’s really only limited by what you already have in the pantry and fridge. 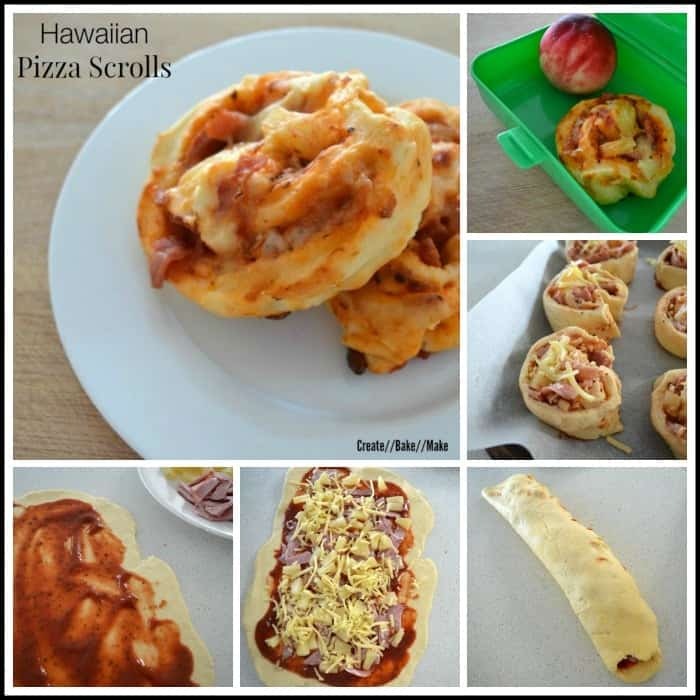 These scrolls were a big hit with both the boys, and as well as being a great morning tea treat, they would also make a great lunchbox filler or after school snack. Slowly add the milk and use a butter knife to combine.Turn out the dough and knead until it forms a smooth ball.Use a rolling pin to roll dough out until you have a 30 x 40cm rectangle. Spoon the pizza sauce over the dough, leaving a 2cm gap around the edges. Scatter the ham, pineapple and cheese over the pizza sauce. Place on a baking tray and sprinkle with a little extra grated cheese. Follow instructions above from step 6. I’d love to hear your favourite snack and lunchbox recipes – what do your kids love? I hate working with yeast, it never seems to obey me, so I love that the dough is so easy I can ever make it! Ham and pineapple is one of our favourite combinations. Too easy! These are so easy Sam, you will love them! 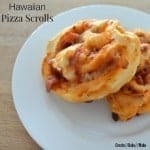 I cheat and make pizza scrolls with puff pastry! But this looks easy too! Would you believe I haven’t made them with Puff Pastry before?!?! They really are easy Bec, the girls will love them! This is a great recipe, Lauren. They’ll be popular at our house, Bell loves anything with ham and pineapple. Thanks Lisa, you really can’t go wrong with Ham and Pineapple I think! Adding this to my lunch box Pinterest board – thanks. Yum, these look great! I make vegemite scrolls with puff pastry and use tasty cheese and Parmesan. They are delicious! Ooh they sound great Tegan! No problem Lauren, these would be a great lunch box treat! How can they not like pineapple?!?!?! Did you make thesexwith shaved ham or diced ham?